This book affirms the deep contextual understanding of past, present and future UK healthcare policy you might expect from the Director of the Centre for Public Policy Research Alan Cribb. In it he explores the move away from biomedical clinical approaches towards more democratic and social models of care. The chapters outline historical ideas embedded in current healthcare policy and settings, highlight the gaps between current policy and practice, then detail current social, person-centred models of care. Cribb critically evaluates integrated systems of delivery and debates the types of healthcare delivered after the introduction of more democratic models. 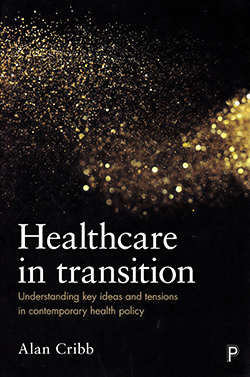 A helpful outline and discussion of the tensions in healthcare is provided.Making room within provision and policy for arbitration between different visions is advocated to enable a ‘bottom-up’ democratic model of healthcare. This is a useful book for anyone interested in the future of healthcare and the application of philosophical models of healthcare delivery to policy provision.